During these past few months I've been thinking a lot about the direction that I would like my blog to head in, with a new year just around the corner it's felt like a good time to make some slow changes. When I first started blogging nearly 5 years ago this was just a beauty blog, I rarely talked about anything else. However, as the years went by I found myself wanting to talk about more lifestyle related topics and slowly I started building up the courage to talk about disability. Daily blogging in October definitely showed me what I enjoy writing about and talking about topics relating to my health and disability in general is definitely the direction that I want to lead my blog in, especially in 2017. This then got me thinking about what kind of brands I want to build good relationships with, I've always worked with mainly beauty brands (and I still love to and want to) but when it comes to talking about health and disability I've not quite built myself up enough to attract anyone. So, I decided to take things into my own hands. 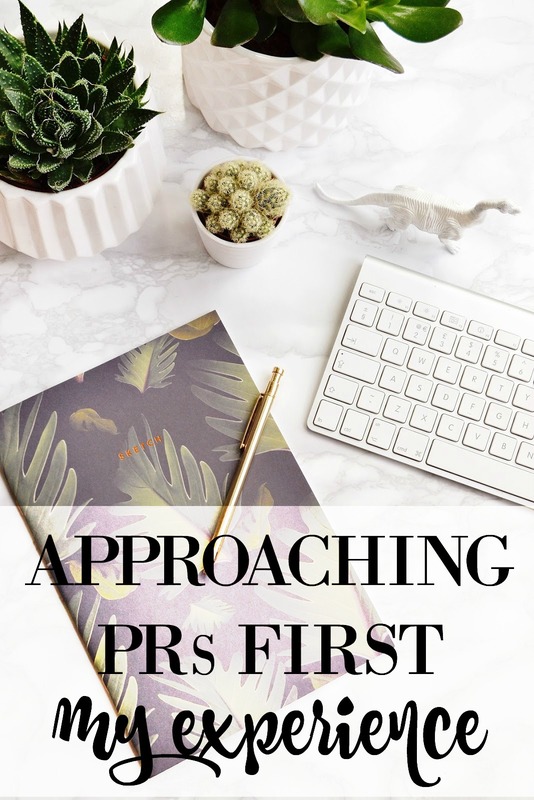 Every now and then the topic of contacting PRs first pops up in the blogging world and I've always been a believer in contacting first, yet I've never had the courage to do it until this month. I think if you can offer a brand something and you're genuinely interested in their product then why not send them an email to introduce yourself, that's exactly what I did. I searched on google to find some blog posts to help me type up a good introductory email and then I sent it off to a brand that I feel would fit in perfectly with my new direction, a brand that I feel I can offer something to. In my email I simply introduced my blog, who I am, what I talk about and added in some of my general statistics and social media numbers. I didn't ask for anything, I enquired about perhaps being added to their database to keep up to date with any new products or progress, but that's all. I think that is the key when approaching PRs and brands first, just introduce yourself. If they like your blog and think you would work well together then they are most likely to get back in contact at some point with an opportunity. When I heard back from the brand I contacted I was delighted to see that they were on the same wavelength as me, they thought my blog and their product were a great fit. I expressed that I was interested in building up a strong long term relationship with their brand, rather than just reviewing a product and never emailing again. I think this is what I'll propose when I contact any brand, if I'm contacting a PR first then it's because I'm truly passionate about what their product offers therefore I will always prefer to keep in contact with them than just review a product and never speak a word to them again. I'm not the best at giving advice when it comes to these things, I think I just really wanted to say that it's totally okay to contact first, rather than wait for emails to come into your inbox. There are a lot of blogs out there and you are probably making the PRs job easier by contacting them first, saves them going through hundreds of blogs! Just make sure you are truly interested in the brand, their products and what they represent, if you aren't then it will show. I'd love to know whether you've contacted brands/PRs first before and how it went, let me know in the comments! This is so helpful! I think I might try it out myself and see what happens! I really loved reading this! I love getting on contact with PRs first! However, I am trying to build more long term relationships with them! Like you said instead of just emailing write a review and never speak again! Thank you for posting this!